What’s the secret behind this natural hot springs pool, and why does it draw people from even international locations? Read on to learn tips for what your family needs to bring during your visit, and why the grown ups will enjoy it just as much as the kids. 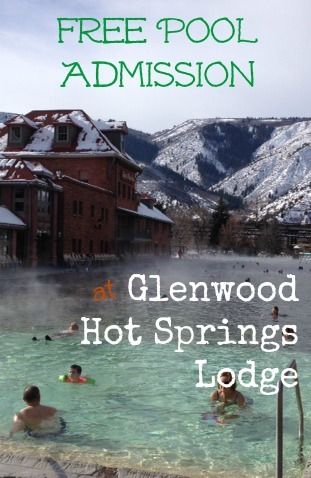 Also I’ll share how a stay at the Glenwood Hot Springs Resort can save you considerable money, when the included amenities are taken into consideration. 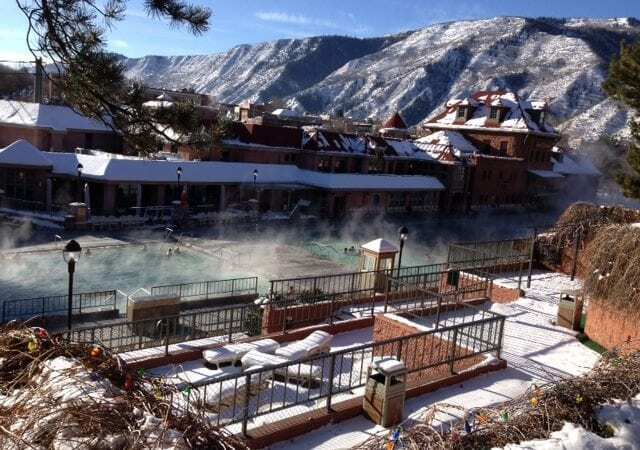 Glenwood Hot Springs Resort is conveniently located right along Colorado’s I-70 in Glenwood Springs. Easy to find, and centrally located in the state, it’s an excellent place to stop and spend a couple of tourist days. People come from miles around to enjoy the hot springs pool, hike or ski in nearby mountains, and take in the ambiance of this hip mountain town. But the highlight of this area is definitely the theraputic, mineral rich pool – loved and enjoyed by young and old alike. Staying at the Glenwood Hot Springs Resort will put you in the closest possible accommodations, and actually includes unlimited admission to the hot springs pool. Unlimited hot springs pool access – Parents love soaking in this soothing hot springs pool as much as kids love swimming in it. It’s an awesome win-win, and you’ll both enjoy your time spent here. Outdoor deck – I love being able to step out for fresh air, and in the case of Glenwood Hot Springs Resort, see a lovely mountain view in almost every direction. The deck area wasn’t huge, but did contribute to a feeling of adding some space to our accommodations. It appears that most, if not all, units offer one. Hot breakfast Included – We were impressed with the made to order, hot breakfast that is complimentary with your stay. Hours are generous, and breakfast is served until 11 a.m. (don’t you hate when you’re on vacation… and breakfast stops serving at 9 a.m.?!) 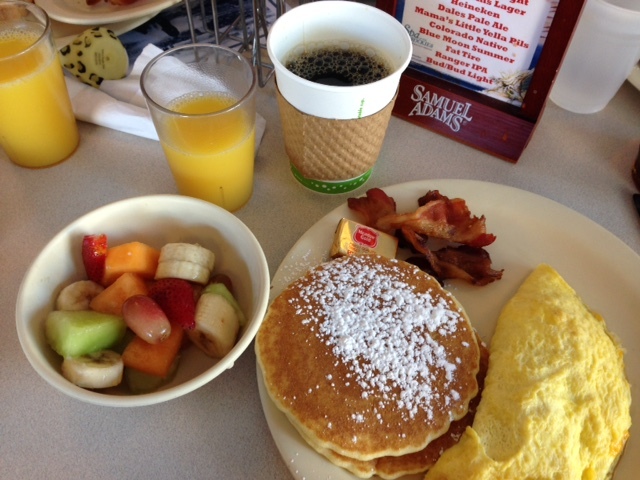 My kids ordered a couple of hot foods like hash browns and pancakes, but also really liked having continental breakfast items such as fresh cut up fruit and bagels available. It was the best I saw my slender 5 year old son eat during our entire vacation. 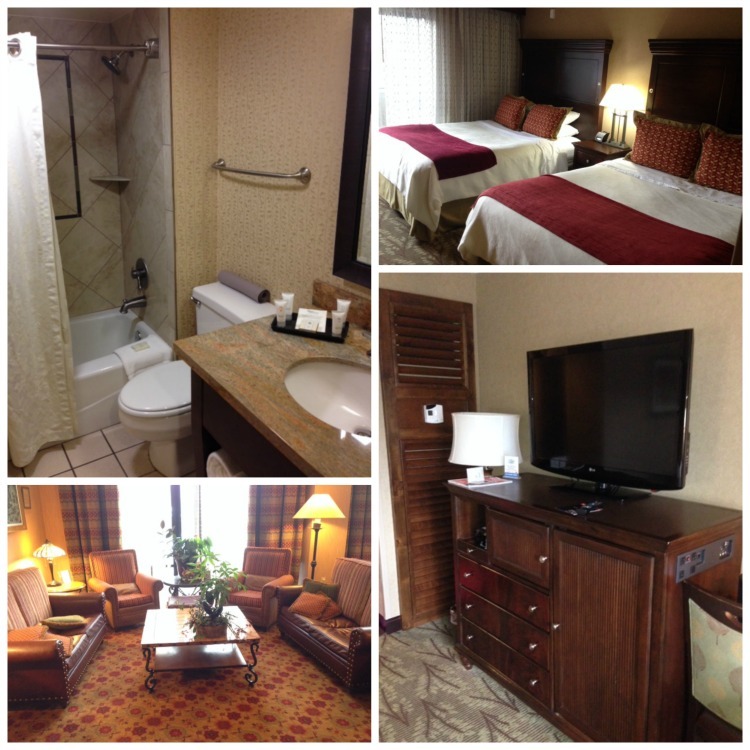 Small room – We stayed in a double queen room. While our deck view was lovely, the room felt cramped. There was about six inches between the outer edge of each bed and the wall. I don’t like my family *that* much! I felt a little claustrophobic with four of us and all our gear. Four people would definitely be the max in one room of this type. Pool & restaurant located across the street – The Glenwood Hot Springs Pool and Grill restaurant where breakfast is served are both located across the street. Not a huge deal, unless it’s chilly. And you’re wet. I’m not sure that they can do much about this, but we were wishing there was an indoor tunnel between the two. 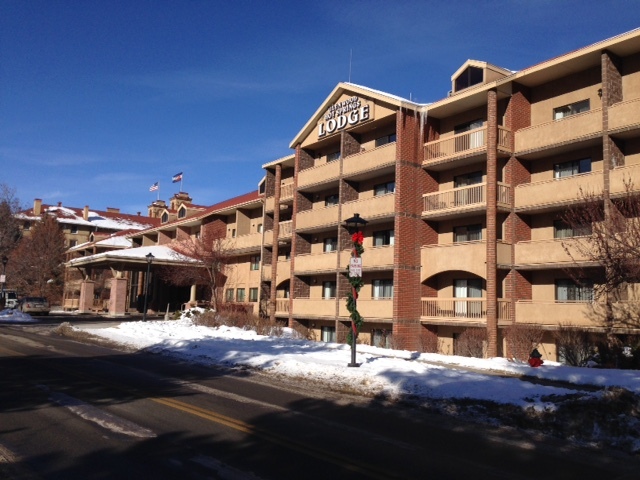 Granted… this is still the hotel with closest proximity to the Hot Springs pool in Glenwood Springs. We visited in January 2016, and the base price for a standard room was $$; suites and family rooms are available for $$$-$$$$. Included is full access to Glenwood Hot Springs pools starting from arrival day through departure day, complimentary hot made-to-order breakfast, internet, mini-fridge, microwave, safe, and iPod docking alarm clock. The big draw here is absolutely the Glenwood Hot Springs Pool. And quite a draw it is, for everyone from Denver area residents who will drive nearly three hours in order to visit, to international vacationers you’ll hear speaking a variety of languages. 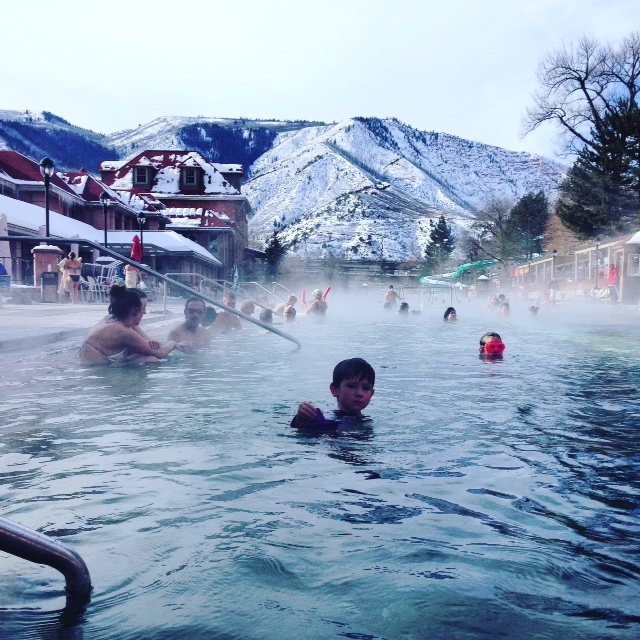 In addition to how relaxing soaking in the Glenwood Hot Springs pool is, if you’ve ever tried it after a rigorous day of hiking or skiing you’ll be convinced of its therapeutic benefits. You know how your kids always want to swim, do nothing but swim, and then swim some more on vacation? Finally there’s a pool that adults enjoy spending hours in, just as much as children do. Skip wearing jewelry. The high mineral content of the water can have unpredictable, corrosive effects on it. Bring a water bottle. You’ll need to stay hydrated, and will be able to stay and enjoy the pool much longer if you drink plenty of water. Bring clothing or a robe you can pull on before and after using the pool, as you’ll have to trek across the street. It’s chilly in the winter! You’ll be fine once in the water, and the pool is used yearround. Wear flip flops, or shoes you won’t need to go out to dinner in later that night. Soggy boots are a drag. Lockers are available for 50 cents. If you stay at the lodge, you’ll be provided with 2 free towels to use, per person. You can easily spend 2-3 highly relaxing hours here. Inflatable pool toys are acceptable. Start out with a full stomach, so you don’t have to leave to go eat. If it’s windy and winter temps… you’ll see locals wearing stocking caps. Might not be a bad idea to have one on hand if you visit during the months of December-February. The Glenwood Hot Springs Lodge is located right across the street from the Hot Springs pool. 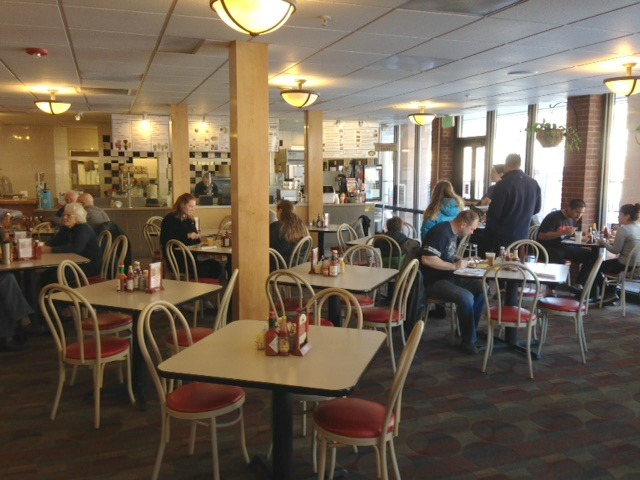 It’s a great central location within Glenwood Springs, from which you can easily walk across the bridge to the town’s best restaurants. Our room was beautifully decorated with quality linens and rich dark woods. 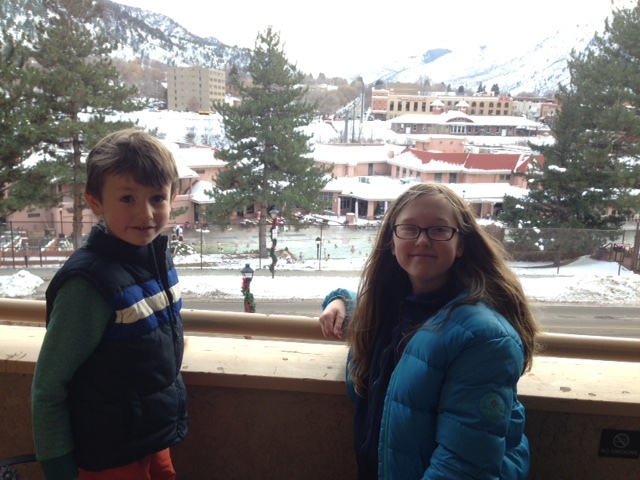 We loved having our own balcony, to step out and gaze at the nearby snowy mountains, or check out the crowds at the hot springs pool across the street. 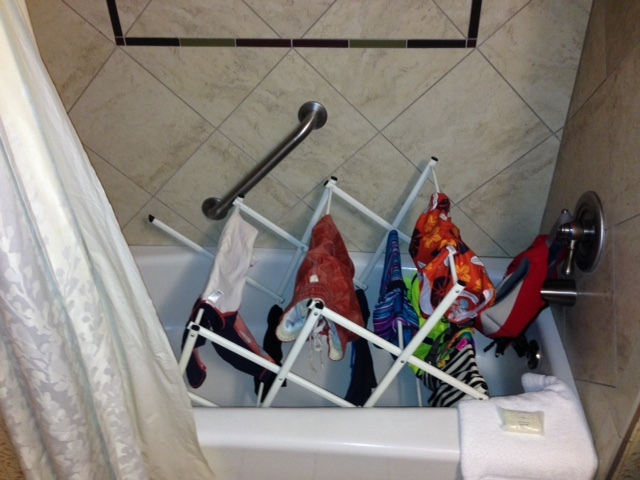 I was highly impressed by the swim clothes drying rack we found in the closet. This is brilliant! All hotels with a pool or ocean nearby should have one of these tucked away, to set in the tub and be able to hang and dry everyone’s wet suits. The mattresses were thick, and beds quite comfortable. I’m picky when it comes to pillows, so I was happy to discover nice fluffy pillows along with soft, warm bedding. The bathroom amenity products were of nice quality, one of the same brands used at the Spa of the Rockies. In the Glenwood Hot Springs Lodge rooms you’ll find a microwave, mini fridge, flat screen TV, in-room safe, premium toiletries from the spa, hair dryer, coffee maker, iPod docking alarm, and free Wi-Fi. As previously mentioned, all rooms appear to have a patio or balcony. Each member of your travel party will receive complimentary, hot made-to-order breakfast, and unlimited access to the hot springs pool – including on the day of departure. There’s a significant value included when you do the math on just the cost savings from free hot springs pool entrance and breakfast. You can see why it’s smart to give staying at the Glenwood Hot Springs Lodge a close look, if you’ll be enjoying the area and hot springs pool. Although we didn’t take advantage of it, I also wanted to mention a nice package Glenwood Hot Springs Lodge has available: Ski, Swim, Stay. 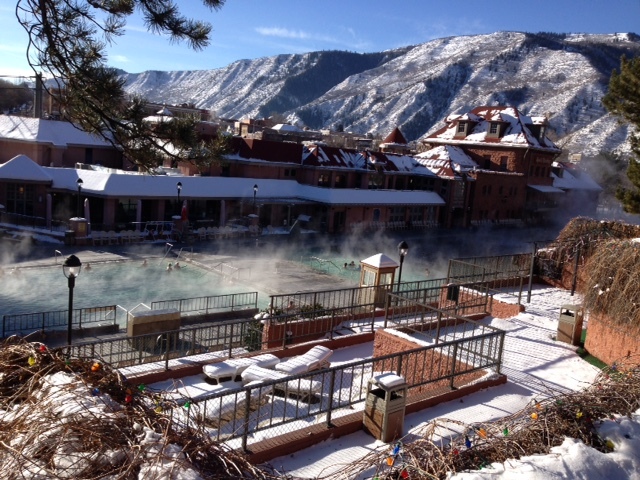 The only thing better than soaking in the Glenwood Hot Springs pool… is doing so after a day on the slopes! Sunlight Mountain is near Glenwood Springs, and is a smaller resort with a more affordable lift ticket. I’ve skied here and love it, as I find it a little less daunting than some of the huge Colorado ski areas. Sunlight offer some great runs, and there is a shuttle available that picks up at the hotel on a regular schedule. One free lift ticket for a child (age 12 and under) is included, per night. This deal is available December 12th, 2015 – April 3rd, 2016; check their website for more information and rates. Tami Mittan has lived in Colorado for a decade, and feels happiest when there are mountains on the horizon. She loves spending time outdoors with her husband and 2 kids, frequently exploring their backyard nature playground through hiking, camping, and biking. 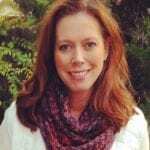 Although Tami is employed as a computer programmer, she’s a writer at heart and enjoys blogging at Colorado Mountain Mom about her family’s outdoor and travel adventures, and her occasional forays into fitness and fashion. She simply can’t get enough of travel, Disney World, and chocolate cake.